Want email notification of new posts? Want posts to load into your web browser? For shy people,finding ourselves prominently displayed in a newspaper can be unnerving. 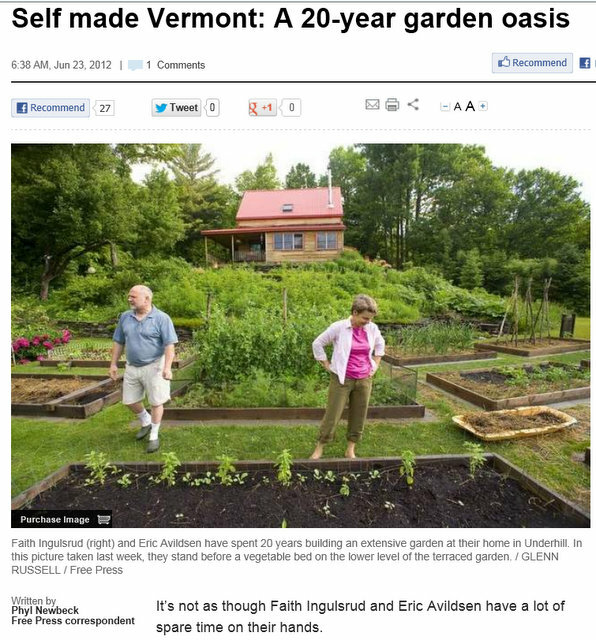 But Phyl Newbeck’s story on our evolving garden in the DYI section of the Burlington Free Press on June 26,2012, treated us gently and gave us a chance to share a bit of what we’ve learned over the years. Here are some additional comments and clarifications from the gardener. …<she>starts perusing seed catalogs in January to come up with a blueprint for the garden. The beds are rotated annually and at this juncture the couple has more than 100 species in the garden. While I begin work on my seed order in January, the rotation plan is done by fall before the garlic is planted. Much of the garden prep for the coming year can then take place before winter and enabling the overwintering of cold hardy crops as well as super-early planting. In summer,I increasingly plant polycutures in my raised beds, mixing a variety of crops,so while a strict rotation isn’t necessary, to deter the diseases that plague tomatoes in our climate,I make sure 3-years have gone by before I plant any of that family (potatoes,peppers,eggplants) in each bed. 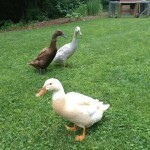 Daisy,Brownwyn and Earl Gray -- ducks who eat slugs and convert them to eggs. Slug patrol is performed by a trio of geese who also provide the couple with eggs. 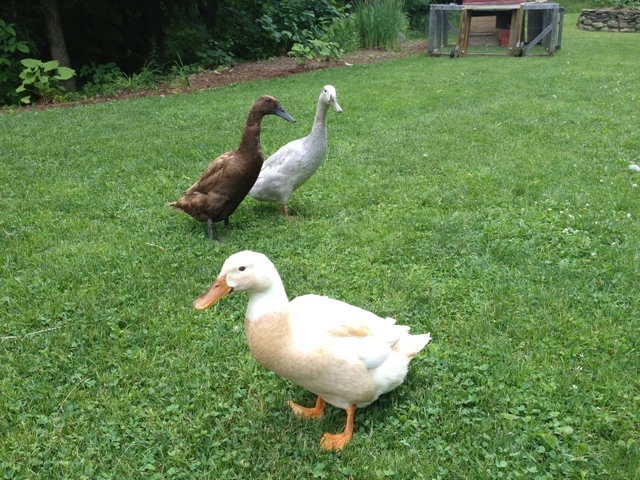 Indian Runner ducks do our slug control —they are much smaller and easier to handle than geese! Daisy,the matron,leads her followers – the two we kept from the ducklings raised last summer. Their siblings went to live at Tom and Ann’s duck-heaven in Jericho where the flock is guarded by an enormous goose,aptly named King. The couple tries to avoid growing surplus,planting only enough for their needs and what can be stored in the root cellar. We grow enough surplus to share but prefer not to spend time on food preservation. Instead we aim to grow a little of a lot of different crops so we have a variety of seasonal selections at all times and by extending the season on both ends,we can ensure fresh harvests for as long as possible. For a few,high value items like raspberry jam and basil pesto,we deem the time spent in the kitchen to be worthwhile. In the photo gallery,the last photo depits my “hardy”fig plant. This variety,Celeste,isn’t necessarily any hardier than any others but we store the potted plant in our root cellar during the coldest winter months. I welcome any input that other Z4 gardeners can offer on growing figs and am happy to swap cuttings. Once I figure out how to coax more than 2-3 figs from each plant,I will be sure to report on it here! What a nice article —congratulations! And your garden is simply amazing. As a gardening newbie,I’m quite jealous. 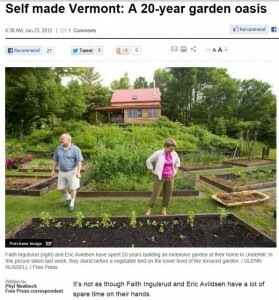 BTW,I found your blog via Two Towns Online —I live in Jericho and maintain a food blog myself. Dear Faith,I read all of the articles in your blog. Love it! I got a lot of ideas to copy and try in my new raised garden beds. The pictures of your garden are so inspiring! I am new to the zone 4b and was wondering if you could share some ideas on the planting schedule. Thank you. Garden Rant –Definitive garden blog. Kitchen Gardeners InternationalAll about growing your own food.